Today is my cancerversary. Two years ago on this date, I was diagnosed with advanced lung cancer. While my current status is No Evidence of Disease, I know the cancer is still lurking in my body; it’s only being suppressed (not cured) by the targeted drug crizotinib. I’ve felt myself sliding towards depression this week. I know from past experience what depression feels like, and I do not want to go there again. I suspect subconcious awareness of my cancerversary is part of the reason. Physical discomfort due to treatment side effects (especially hand pain), steroid-induced excess weight and a newly-diagnosed partial hamstring tear aren’t helping matters. It also bugs me that fatigue has kept me from being as supportive as I’d like when my husband recently had cataract surgery. When I woke up this morning, I realized that somehow, sometime, I had adopted a victim mentality. I have been passively accepting the crap that my body was handing me. That is simply not acceptable. True, the cancer ain’t gone, but neither am I! Through no small effort of many people, including myself, I am alive. I am not going to waste the gift. I can’t choose not to have cancer, but I CAN choose how I want to feel about it. Today, I choose to feel empowered and hopeful. I can’t choose not to have side effects, but I CAN choose not to let the discomforts of my body keep me from exercising. Exercise makes a huge difference in my mood. Today, I choose to go swimming for the first time in years. I can’t choose not to be fatigued, but I CAN choose how I react when the irritability rises unbidden. Today, I choose to hold my tongue and listen for understanding. Today, my cancerversary commemorates not just the start of my cancer battle, but my renewed efforts to LIVE. 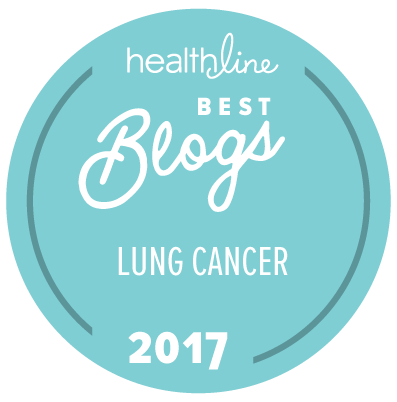 This entry was posted in Lung Cancer, The Bright Side and tagged Cancerversary, Hope, Lung cancer. Bookmark the permalink. That’s the spirit Janet. I think we all have to be reminded as to the choices we CAN make. We haven’t met in person but your spirit and strength have helped my spirit to find new wings. April 24th was my first year cancerversary. It just so happens that April 24th was also the 3rd anniversary of my brain hemorhage. I love the fact that you will not allow the victim mentality to become you. I’ll try to remember this when I get depressed as well. Learning to live a different way has become my choice. Living this life One Day At A Time in the truest fashion, is my best weapon against disease. Thanks for continuing to share your wonderful attitude. Blessings for your continued good health. New undies are always uplifting! Good advice for everyone: take charge of what you can control and do your best not to let the rest control you. I hope you got the fanciest underwear you could find! Thank you for the reminder that my attitude is my choice. I had been feeding my fear. Luckily, I decided to kick fear out of my house and have readjusted my attitude! Love your attitude and your willingness to share with others! You are an inspiration! Yep. Carpe diem dude. I also choose to live and do what I want now. Hence Egypt. Next up? I think maybe the Galápagos Islands by kayak. Well, a plane and kayak and a nice boat. Or something. What an awesome attitude you have. I have depressive tendencies and try to push them away. It is so hard when life seems to get in way. Thanks for stopping by, jazzbo. I’ve had to deal with depression, too. I know it can be tough to handle as a lung cancer survivor. Exercise seems to help me (and a lightbox during the shorter days). Good luck to you!